Only Becker Genuine Parts are specifically engineered, manufactured and tested to deliver the optimal performance of your Becker vacuum pumps, compressors, and blowers. Becker Genuine Parts are not only guaranteed to fit but help maintain valuable warranty coverage. 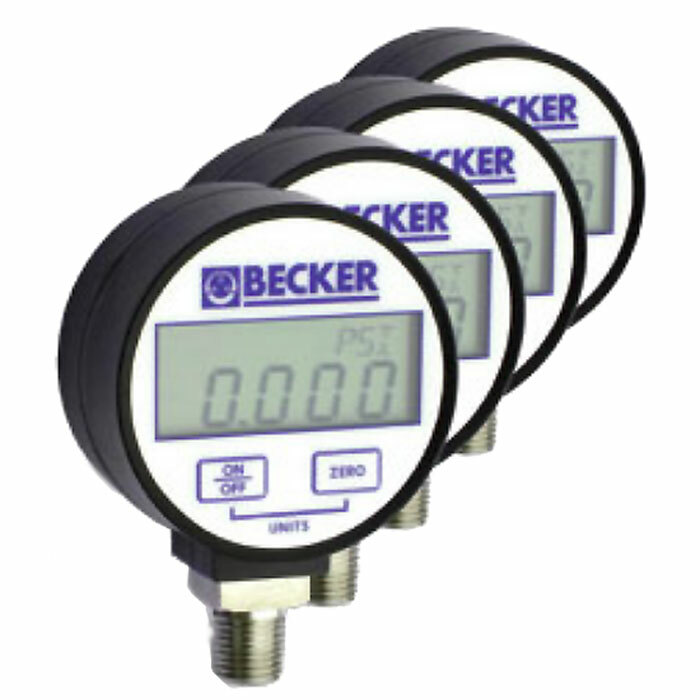 We offer a selection of Becker accessories including gauges, filters, separators, conveying eductors, maintenance kits, vacuum pump oil|grease, and sound reducing enclosures. These Clear Polycarbonate Filters offer easy visual inspection of the filter element. At a glance, your maintenance staff can quickly see if the element is dirty or clogged. Why should you have these filters in your plant? No more piping issues with horizontal configuration. Easy to install into existing vacuum lines. 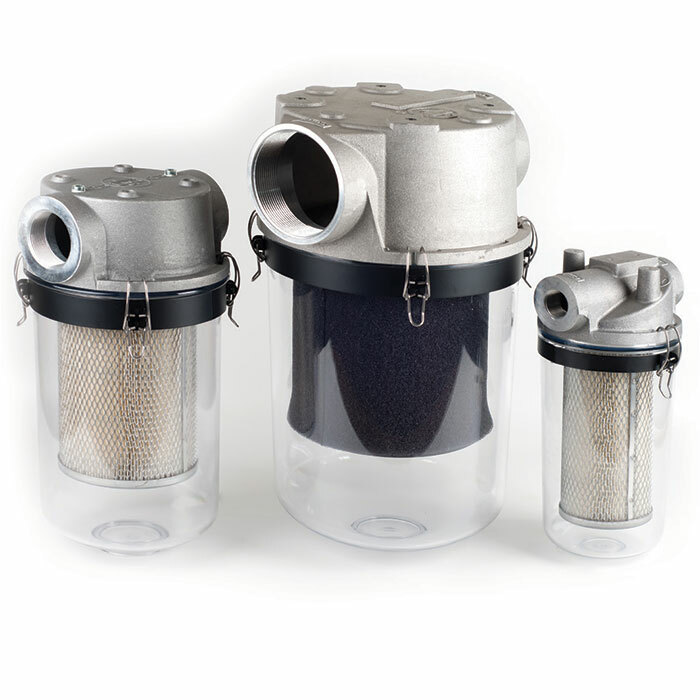 When your vacuum process is turned off, no filtered particulates can fall into the pump. 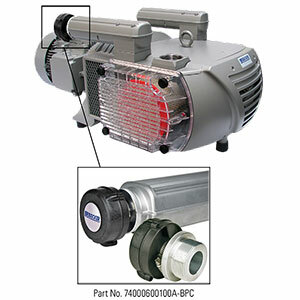 Significantly reduces the risk of a clogged element which can cause overheating, pump failure, and loss of production. No more interrupting your vacuum process to check the filter elements. Less maintenance time required for routine inspections. The workplace can be a very dusty environment, especially in the woodworking industry. The innovative Becker Cyclonic Filter BRD-60 keeps the vacuum relief valve on your Becker Model VTLF/VXLF vacuum pumps from clogging with saw dust and particulates. Utilizing the new Becker Cyclonic Filter BRD-60 is a simple and cost effective way to prevent costly, premature vane wear or, worse yet, bearing failure. Comes completely assembled and installs in seconds. Operation is purely mechanical. Once installed, there is zero maintenance. One size fits all Becker VTLF/VXLF pump models. Comes with a fitted adapter for quick installation. Simply screw it in! Becker Pumps are known as being among the quietest vacuum pumps and compressors available, but there are times when even that is not enough. Occasionally, pumps must be placed in an environment that mandates sound levels below those at which our pumps operate. 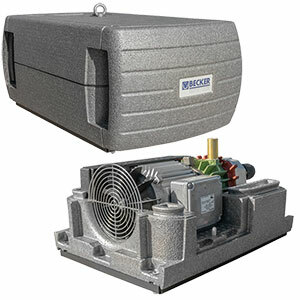 For those occasions, Becker offers a line of low-cost sound reducing enclosures that are specifically designed to lower noise levels, while permitting the pumps to operate at conditions that ensure long-life. While sound enclosures can be found from a number of sources, no one understands the specific cooling requirements of Becker pumps better than Becker. Each Becker sound enclosure fits our pump like a glove, yet provides essential cooling at just the right spots. Our sound reducing enclosures are light, compact and chemical resistant.